Mach 1: the story has been told thousands of times of Chuck Yeager and that special day over Muroc, when the first sonic booms rattled windows. But sitting in church this morning, I looked over to a lady and her son who have a different take on that historical achievement. Dorothy Roth’s husband and John’s dad started out his flying career in Nebraska when World War II broke out. He signed up to become a pilot in the Army Air Corps. 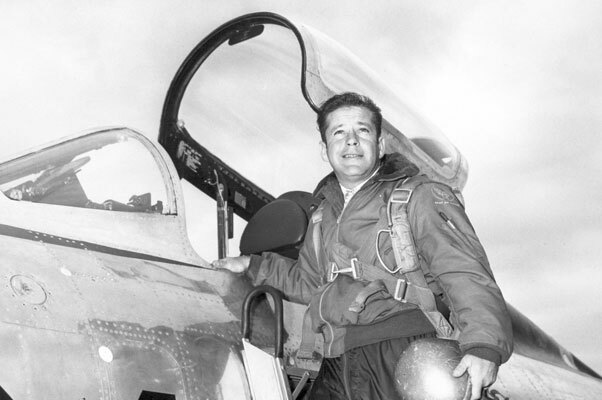 I wonder if he ever knew how the winds of fate would guide him to a date with destiny in the skies over the Antelope Valley and that magic Mach number. The race for Mach 1 between Bell and North American was in full swing — Chuck Yeager, George “Wheaties” Welch and the manufacturers had a full-court press going to be the first. The day came and Chuck Yeager captured the prize as the first man to pass the magic number of Mach 1. But some say that that on the same day, George Welch pushed past that number in his North American built F-86! Nothing like a little competition between pilots and manufacturers to fuel the spirit of pride in being first when it came to advancements in aviation! So where does Rusty fit into this story? Well, Chuck did end up with the prize, but under conditions that are not recognized by the Federation Aeronautique International! The rules stated that the aircraft had to take off and land under its own power and that it could not do it in a dive. George Welch did take off and land under his own power but the speed run was in a dive and Captain Yeager was slung under the belly of the B-29. Now Rusty was involved in a Republic project with the XF-91 and on Dec. 9, 1952, Rusty took off under his own power from Edwards, climbed to 35,000 feet, leveled off and with a turbojet for primary power plus an auxiliary rocket, broke the sound barrier without much fanfare by the rules! So in the world of records — not firsts — Rusty Roth ended up with the prize! Does this change the way we look at history? No, that has been written and it’s well-entrenched in the history books and our national pride, and this little story is not to take away from anybody and their achievements. But I hope it brings to light the pride of the Roth family. John and his brother Dan were both career Edwards guys and Rusty’s grandson who is named after Rusty is now working at Edwards also! The history books and Rusty’s life in aviation only go as far as when Republic Aviation told Rusty that on his 40th birthday his flying days were over. He walked away and, of all things, got his real-estate license and sold houses to pilots in the Antelope Valley running a local realty company. “Not really, just flew a jet really fast and maybe set a world record, now what’s for dinner?” Got to love the quiet ones!